TRS working president KT Rama Rao speaks during a road show in Suryapet on Tuesday. Nalgonda: TRS working president K T Rama Rao on Tuesday said with a non-BJP, non-Congress coalition government at the Centre a certainty, even a single MP can play a crucial role after the Parliament elections. Chief Minister K Chandrashekhar Rao, with just two MPs, could achieve Statehood for Telangana. 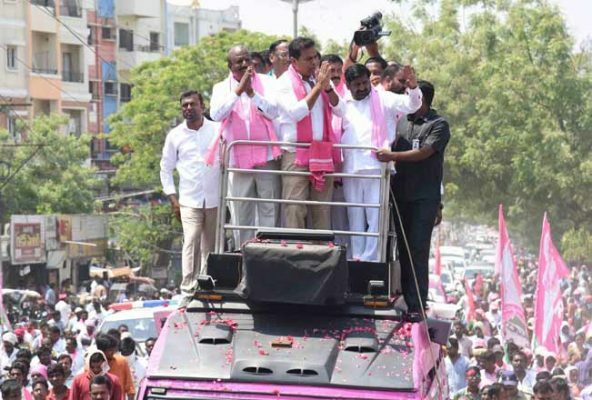 If the TRS wins 16 seats in the April 11 Parliament elections, the party will play a crucial role in government formation at the Centre after the polls, Rama Rao said, at the culmination of his road show here. 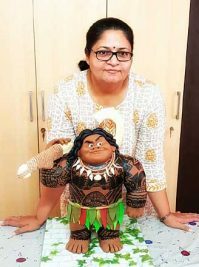 Explaining that the TRS, which has 11 MPs in the outgoing Lok Sabha, could not bring much pressure on the Narendra Modi government because of the huge majority enjoyed by the BJP, the TRS leader said this time around, however, the BJP was unlikely to go beyond the 150 seats mark while the Congress will have to be content with less than 100 seats. “Given this emerging situation, it is clear that a non-BJP, non-Congress coalition may get the chance to form the government at the Centre. Hence, every single MP will play a crucial role at the Centre after the elections, which in turn means that TRS will play a key role in forming the government at the Centre if it wins 16 Lok Sabha seats,” he added. “Congress MPs will only think of how they can be of any benefit to Rahul Gandhi, while BJP MPs will think of the same for Modi. But, TRS with 16 MPs will only mean more benefits for our State,” he said, adding that the Chief Minister will be able to mount pressure on the Centre and bring additional funds to the State for its development and irrigation projects. 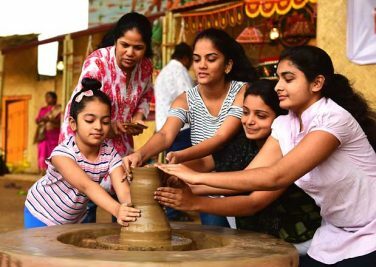 “It will also help us secure national project status for Kaleshwaram project and Palamuru Lift Irrigation scheme, besides facilitating funds for Mission Bhagiratha and Mission Kakatiya,” Rama Rao said, adding that there would be several other advantages including wielding influence at the Centre if the numbers are high. He cited the example of the merger of seven mandals from Khammam district with Andhra Pradesh, stating that AP Chief Minister Nara Chandrababu Naidu used the TDP numbers to influence Prime Minister Narendra Modi on this issue. Taking potshots at the Congress for its advertisements portraying Rahul Gandhi saying “Ab hoga Nyay” (justice will happen now)”, he wondered whether the Congress president was now admitting there was no justice during the tenures of Jawaharlal Nehru, Indira Gandhi and Rajiv Gandhi. Taking objection TPCC president N Uttam Kumar Reddy’s statement that development was possible only if national parties were at the helm of affairs, the TRS working president questioned as to why the country did not witness development or poverty was eradicated in 55 years of Congress and 15 years of BJP rule in independent India. He also recalled that Congress leaders from Nalgonda district tried to create hurdles for the setting up of the 4,000 MW Ultra Thermal Power Plant taken up by the TRS government at Damaracharla in the district at a cost of Rs 30,000 crore. It would also create 17,000 jobs for the youth, he added. Switching over to Urdu, Rama Rao said both BJP and Congress have been trying to get votes with slogans based on religion and castes. He asked the people to vote for TRS candidates in the elections for the secular leadership of Chandrasekhar Rao. Stating that TRS candidate from Nalgonda Parliamentary constituency Vemireddy Narsimha Reddy was not new to politics, he said he had played an active role during the Statehood movement. “Please vote for him and ensure his victory with a thumping majority,” he added. Assuring the people to resolve all issues in the constituency if he wins, Narsimha Reddy said he decided to reenter politics to serve the people. Education Minister G Jagdish Reddy, Telangana State Forest Development Corporation Chairman Banda Narender Reddy, Telangana Rythu Samanvaya Samithi president Gutha Sukender Reddy, Rajya Sabha member Badugula Lingaiah Yadav, Nalgonda MLA Kancharla Bhupal Reddy and TRS leaders were also present.